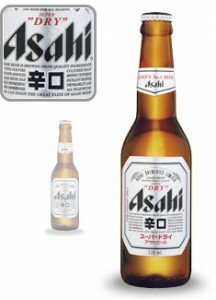 Typical rice-aided Japanese beer goes down smooth and easy. Thin lead ingredients appear to be rice and barley. But Japan’s “Super Dry’ #1 beer is so clean it barely leaves a delicate sourdough-malted cereal graining. In one-quart can, tinny water presence outlasts grain ebb.